If you are one of the many Toronto homeowners out there who have always dreamed of having a pool for your home’s property, now is the time to make that dream a reality. Here at Olympic Pool Services, our team of professional Toronto pool builders can provide you with the quality, comprehensive service you need to create the pool of your dreams for you and your family, and it all starts when you pick up the phone and give us a call. Are you and your family excited about the prospect of investing in a brand new pool for your home, or are you looking for a team of professionals to help you renovate your existing pool? Whatever the case may be, our team of professional Toronto pool builders can provide you with the quality service you need to make your vision a reality. 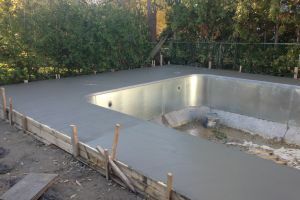 When you are looking for a professional Toronto pool company to help you with your brand new pool construction, then you have come to the right place. Here at Olympic Pool Services, our team of pool building professionals have the skill and experience to help you construct the brand new pool you and your family have always wanted for your home. Our team of professionals will work with you directly to determine which pool design you like, and which ones are going to be best suited to your property, and once all of that is sorted out, our team of professionals will get to work installing it. With our team of skilled professionals on the job, you and your family will be enjoying your home’s new pool area before you know it. If you are like most homeowners with a pool on their property, there are likely going to come times when something goes wrong with your pool, or you just aren’t happy any longer with some aspect of it. For times like those, all you need to do is pick up the phone and give our team of pool renovation specialists a call. When you make the call to our team of experts here at Olympic Pool Services, you can rest assured that our team of experienced pool service professionals will work with you directly to help identify any and all issues that might be present and how best to fix them, or we can provide you with the consultation you need to help you figure out what changes you would like to implement with your pool, and how best to accomplish your goals. If you are looking for a Toronto pool renovation expert, we are only ever just a phone call away.